Sad news in the world of judo after the death of Frenchman Bernard Tchoullouyan. He started the judo in 1963 at ASPTT Marseille. Bernard Tchoullouyan was part of a successful generation for France taking medals at the 1980 Olympic Games where he won bronze in Moscow. In 1981 Tchoullouyan became World Champion U86kg. In total he claimed five European medals, but never the desired gold medal. He took silver in 1981, bronze four times in 1977, 1978, 1980 U78kg and 1982 U86kg. 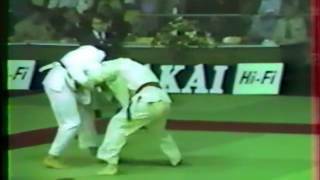 He came close to the gold medal in 1979 at the World Championships in Paris where he lost to Shozo Fujii (JPN) but in the end it was reserved for him. He captured bronze at he 1980 Olympic Games in Moscow after he had lost the semi final against Juan Ferrer Lahera, he defeated Ignacio Sanz Paz for bronze. For gold Choullouyan had to wait until 1981 at the World Championships in Maastricht in his new category U86kg when Tchoullouyan defeated Seiki Nose in the final and defeated the later Olympic Champion Peter Seisenbacher in the eight final. With the French team he captured the European title in 1978 in Paris, in 1980 in The Hague and in Milano in 1982. In France he dominated his categories U78kg and U86kg with five senior title. At the famous Tournoi de Paris, Tchoullouyan took four medals including the gold in 1981, it was his year, the year of Bernard Tchoullouyan. Bernard Tchoullouyan passed away too young at the age of 65 years caused by an heart attack.